Acceleration is defined as the change in velocity per unit of time, or at least that’s what we were told in physics class. Behind the wheel of the 2010 Range Rover Sport Supercharged, it’s defined as something entirely different, namely an emotional and physiological response to 510 supercharged horses being unleashed in an instant. For some, the shock elicits sudden laughter and excitement, for others, silent disbelief is all that can be mustered. Either way, there is little doubting the ability of this 5,816 lb behemoth to completely blow you away, not to mention leave most sports cars in its wake. Fully reworked for 2010, the Range Rover Sport Supercharged takes its place as flagship of the largest mid-cycle refresh in brand history – fitting when you consider it’s the most successful Land Rover model to date. While the exterior tweaks may appear as little more than a minor personality change, inside serious ergonomic and quality improvements are immediately apparent, highlighted by a less button-heavy console. New active suspension can monitor road conditions 500 times per second and make adjustments up to 100 times per second, so the car is never caught off guard. And of course, there is the new 5.0-liter engine, and it’s an absolute belter. The proof is in the comparison to the old car: the 2010 model sees off 0-100 mph and then comes back to a complete stop in the same time it took the old car to do 0-85 mph. That’s a serious improvement indeed. 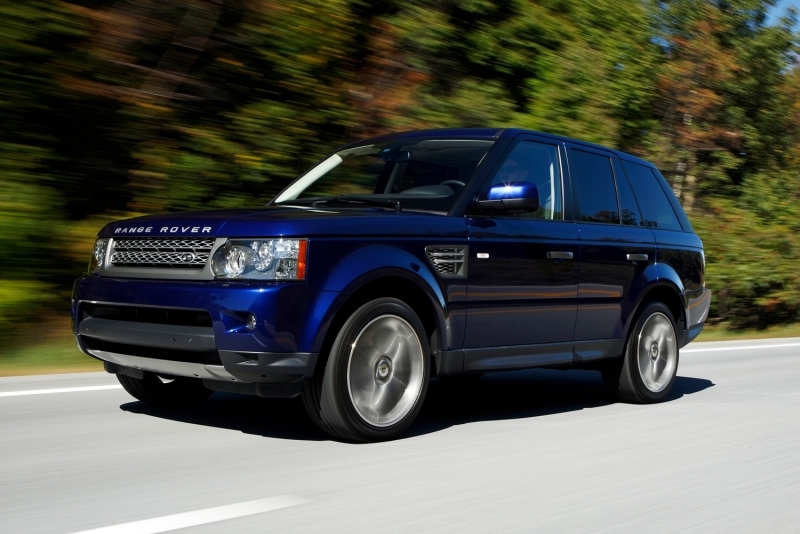 The engine rarely steals the show in SUVs, but then the Range Rover Sport Supercharged is hardly your typical SUV. Endless reserves of silky, powerful supercharged torque are available at the behest of your right foot. There are only six options offered for the vehicle – well, seven if you count both rim options – which really simplifies the buying process and doesn’t make the consumer feel as if they’re pricing themselves out of their own vehicle. Fuel economy is pretty dismal at 12 mpg city, 17 mpg highway. Blame the bulbous 5,816 lb curb weight. Light steering feels as though it has been carried over from one of Land Rover’s off-road setups, and while it never lets you down, more feel and weight would be appreciated from a car with such a sporty attitude. Then again, we suppose it is an SUV after all. Land Rover refers to the Range Rover Sport as the ultimate sports tourer, a car that’s sedate and comfortable when the driver isn’t attacking at full tilt, and once you’ve spent some time behind the wheel it’s hard to disagree. They also claim it’s now sporting when the driver wants it to be thanks to a new dynamic mode, but outright speed probably remains its strongest suit. True enough, the new dynamic mode allows the rear end some mobility through turns, and the steering wheel-mounted paddle shifters add to the experience, but at the end of the day the vehicle’s light steering and overall heft detract from its abilities in sporty driving on asphalt. On gravel, however, it’s a hoot, and leaving the car in a long gear and using the engine’s torque to hustle out of corners is the best way to make progress, with plenty of WRC-style oversteer. But truly, this car’s talent lies in its weight-shedding ability to eat up huge pieces of road in a single, raucous lunge, annihilating 30-100 mph in a scarcely believable matter of seconds. And when it comes time to shave off that speed, six-piston Brembo front brakes complete the task with little drama. 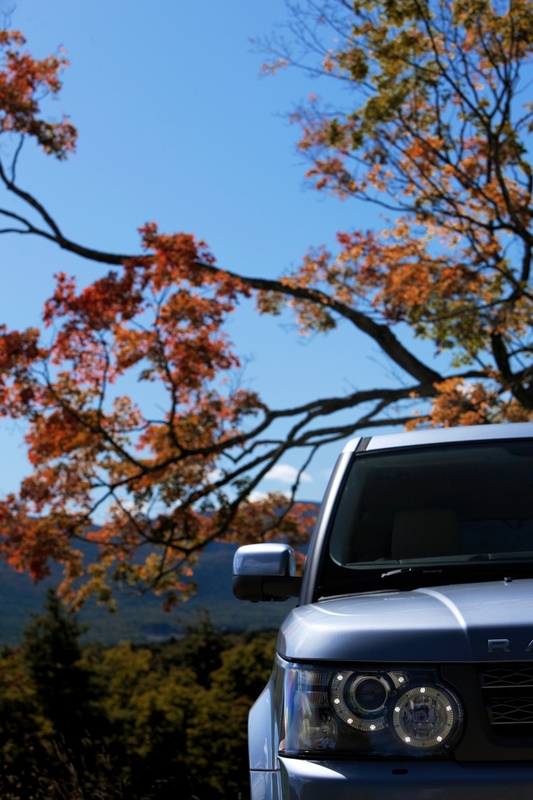 Pass often, love the torque and take advantage of the many comforts, and life with the Range Rover Sport is a perfectly happy one. Assuming you aren’t at the gas pumps, of course. The Range Rover Sport Supercharged uses a 5.0-liter supercharged and direct-injection V-8 engine that delivers 510 horsepower and 461 lb-ft of torque at a pleasingly low 2,500 rpm. The power delivery is utterly fantastic. Power is driven to all four wheels via a ZF six-speed automatic gearbox with a two-speed transfer case and variable locking center differential. The transmission features three modes: Normal, Sport and CommandShift (manual), and the sport mode does a great job of keeping the engine in its powerband, but is never overly aggressive with its shifts. Off-road features such as Hill Descent Control, Gradient Release Control and Land Rover’s famous Terrain Response system – which lets drivers tailor the chassis to various off-road conditions – all come standard on the Sport. Land Rover’s new Surround Camera System is useful both off-road in the wilderness and in the concrete jungles of suburbia. By using five external cameras – one under each mirror, two in the front bumper and one in the rear – the system can help drivers parallel park, steer clear of bumpers and poles in parking lots and avoid obstacles off-road. You can even see underwater when fording a river. Not very useful, but nevertheless a cool feature. Obviously not a Range Rover strong suit, the nearly three-ton Range Rover Sport Supercharged returns just 12 mpg city, 17 mpg highway. Downgrading to the naturally aspirated model will only boost each of those figures by one mpg. The dual cockpit theme of the Range Rover Sport remains, with a high center console separating the two front seats. A less button-heavy dash is a relief, with the nav screen simplifying the overall layout. Six interior color combinations and three trim options are available. 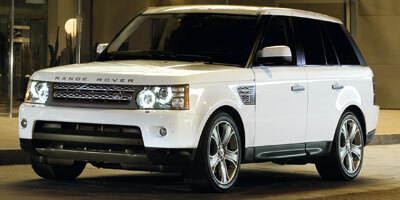 Range Rover’s new LED-lit front end is sleek and modern, giving the car plenty of presence out on the road. 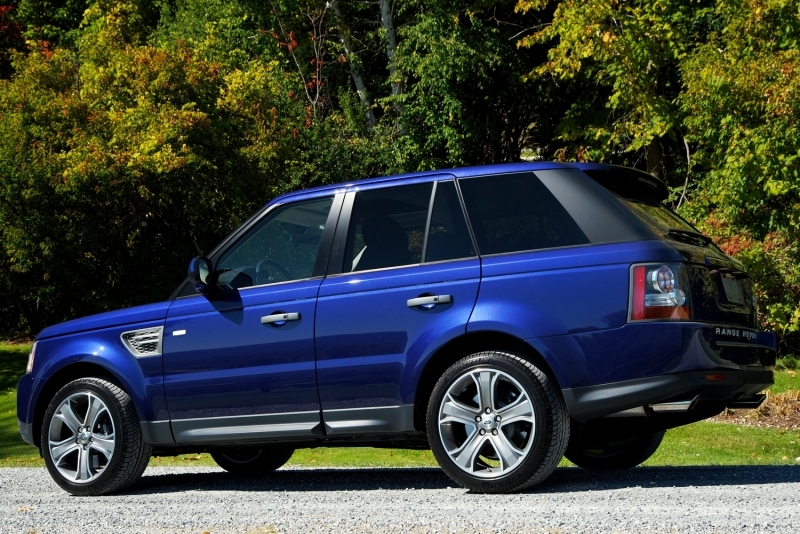 Exterior tweaks for 2010 are subtle but add up to a more aggressive stance, with a raised bumper and two-bar grille further distancing the Sport from the Range Rover. 20-inch rims come standard on the Supercharged, and 13 exterior colors are available. At $74,195, the Range Rover Sport Supercharged comes at a $13,700 premium over the standard Sport, but one 0-100 mph run is about all it takes to convince you it’s worth it. Key competitors include the $98,700 Porsche Cayenne Turbo, $91,050 Mercedes-Benz ML63 AMG and $85,400 BMW X5 M.
Equally at home clambering up a mountain pass or parked up outside a high-end hotel, the Range Rover Sport Supercharged represents a brilliant combination of utilitarian pragmatism and opulent luxury. And when you step on the pedal, it feels as though it’s running on depleted uranium. 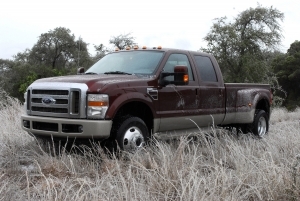 It might not be as capable as the Range Rover off-road, but most of us would trade that for outright grunt any day.